I have a ‘zero waste’ kitchen policy, or as close to zero waste as possible. Herb stems are finely chopped, the greens of green onions go into stock, tomato cores fed to my tomato addicted dog. things are pickled, canned, preserved. One of the best uses for something which is usually discarded is turning the very fragrant skin of the pineapple along with the core into a refreshing and lightly fizzy fermented drink called tepache. And in the case of forgetfulness, a very slightly boozy home-fermented pineapple drink. Choose a pineapple that is ripe and fragrant, but still firm. Avoid pineapples that are showing white mold between the ridges. If you cannot find piloncillo, the dark unrefined sugar cones easily found in Latin centric grocery stores, use dark brown sugar instead. 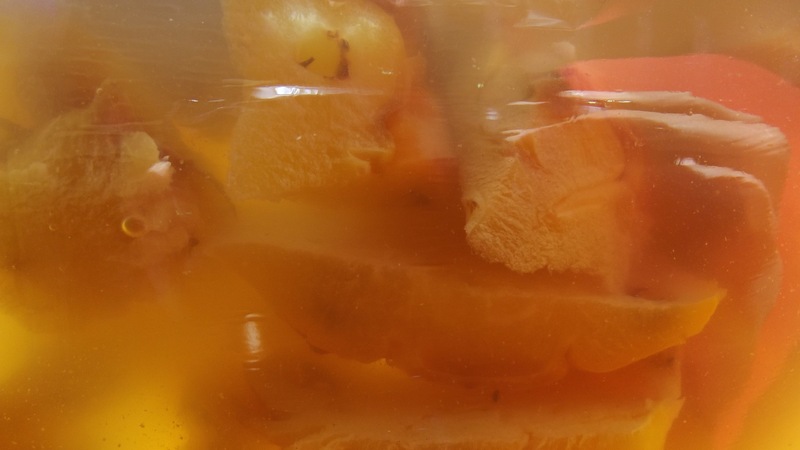 Tepache is a five to seven day process at room temperature. The longer the drink is allowed to rest, the more likely it is to develop a slight bit of alcohol. I do say a slight bit, just enough to know it’s there, not enough to get a buzz. 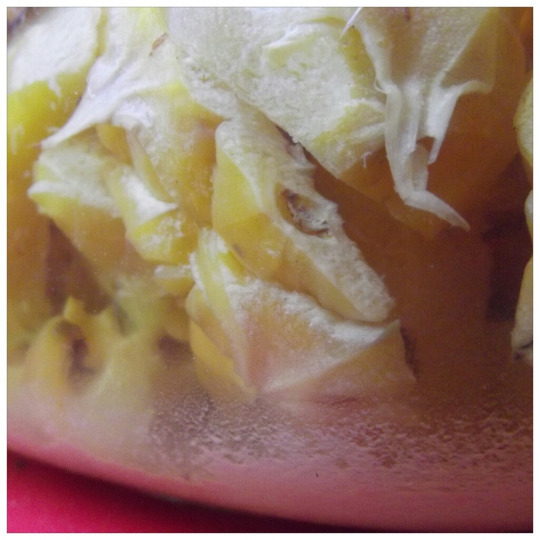 Leaving the tepache to rest for longer than a week and a half will result in vinegar; a good, fully formed vinegar takes two or three months. Use distilled, filtered or previously boiled water for this beverage for best results. Tepache in the first state of fermentation. Roughly chop the pineapple skin and ginger. Place in a food processor and chop until about ¼” to ½” in size. Pour the ground ingredients, and any juice they may have released into a clean 1 gallon container. Break up the cinnamon stick, and lightly crush the whole spices. Add to the container, along with the water. Stir well. Cover the container with a clean dish towel, and secure tightly around the rim with kitchen twine or plastic wrap. Tepache requires air for fermentation, and it is best to prevent any intrusion by fruit flies. Place the container in a warm place, and allow to rest until day 3. The mother forming in fermenting tepache. Place the piloncillo (or brown sugar) and water in a small saucepan. Bring to a boil and simmer until the sugar is completely dissolved. Allow the syrup to cool completely before adding to the fermented pineapple, or the active yeasts may be harmed in the process. Rest the liquid until white sediment has formed in the bottom, an indication of the fermentation process, as well as a slight bit of fizz in the liquid. Taste the drink every so often, to check on the progress. When you’re satisfied with the results, strain the liquid through a very fine mesh strainer, pushing the solids with the back of a spoon and refrigerate. Tepache is best served very cold over ice, and really very enjoyable when mixed with a lager or hefeweizen. Home fermentation is never an exact science, and there are signs that the batch has gone wrong. If the pineapple develops a red hue, it is best to throw it out. A thin white film of mold on the surface of the beverage is normal, as well as some bubbling, both results of the fermentation itself. Trust your sense of smell and taste. If the smell is of anything other than spiced pineapple with slight butterscotch undertones, or the color changes from an amber to something else, changes are, something has gone wrong.